Going into what SHOULD have been the 2012-2013 season, everyone and their brother (outside of Columbus) counted the Blue Jackets out. I heard jokes about the Jackets playing for draft picks, or setting a record of going 0-82. It seemed like no one took the time to look at what happened to the Blue Jackets’ roster and management. They got rid of a cancer in the locker room (Nash), brought in playoff experience and scoring depth (Dubinksy, Anisimov, Foligno), and fortified their defense (Aucoin). Not to mention add depth and talent to their goaltending situation with Bobrovsky. The rest of the league has to face facts; the Blue Jackets are not the bottom of the barrel team anymore. Will they make playoffs this year? I don’t think so, not yet. But I do predict they finish between 9-12 in the West. Already situated third in the Central Division after two games, the Blue Jackets surely surprised many hockey fans during this opening weekend. Against Nashville, the Blue Jackets showed the hockey community that not only is their outerwear blue, but their collar is as well. Tough, hard-nosed, hard-work hockey helped the Jackets rebound after going down 1-0 in the first 40 seconds of the season opener in Nashville. They played a physical game, and the puck found its way to the sticks of players who know how to score. Foligno and Anisimov started to show they are worth the prices paid for them. 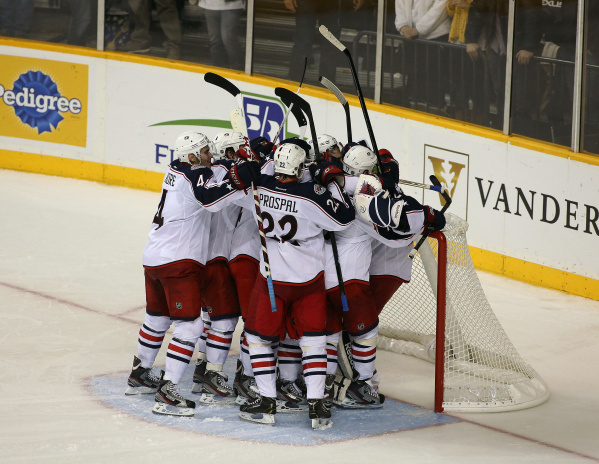 In the shootout, Anisimov and Brassard helped Bobrovsky ensure a victory against Pekka Rinne and the Preds. The home opener against Detroit was a similar story, with a special teams twist. The Jackets took only four penalties against the Predators, but a whopping 10 against the Red Wings. Columbus forfeited 7 power plays to the Red Wings, but denied Detroit on every attempt. On the other hand, the Blue Jackets tallied 2 power play goals (Wisniewski, Prospal) on seven attempts to help Cam Atkinson’s breakaway goal put Detroit on their heels. Unfortunately for the Blue Jackets, Detroit managed to tie the game at 3 with 6:04 left in the third period. Overtime was a draw, leading the teams into a shootout. Jimmy Howard blanked 4 of 4 Columbus shooters, setting the stage for Damien Brunner to deke out Bobrovsky for the win. The blue-collar physical play of the Jackets proved to be on the other side of the edge at times. Having to kill 7 penalties will take most of the momentum out of any team’s game, and a successful PK rarely injects that energy back into the players. Had the Blue Jackets stayed out of the box, it is likely they would have sent Detroit home with another loss. Overall, the Blue Jackets showed the NHL, the fans, and the doubting Thomases of the world that Columbus is no joke. The Blue Jackets head out west this week to face Phoenix (1/23) and Colorado (1/26). These will be two tough tests for CBJ, but the boys in blue are up to the task. This entry was posted in Columbus Blue Jackets and tagged Artem Anisimov, Cam Atkinson, Columbus Blue Jackets, Derek Brassard, Nick Foligno, Sergei Bobrovsky. Bookmark the permalink.